Power utilities provide a vital service in our daily lives. The electricity they deliver gives us light, heat and the power to electronically communicate. But society’s needs are radically changing, and as a result, today’s utilities are undergoing a monumental shift in the way they do business. A combination of green environmental regulations, disruptive energy technologies, changing electricity consumption patterns, and ongoing efforts to improve electricity reliability and quality are pushing these companies to modernize their distribution systems. 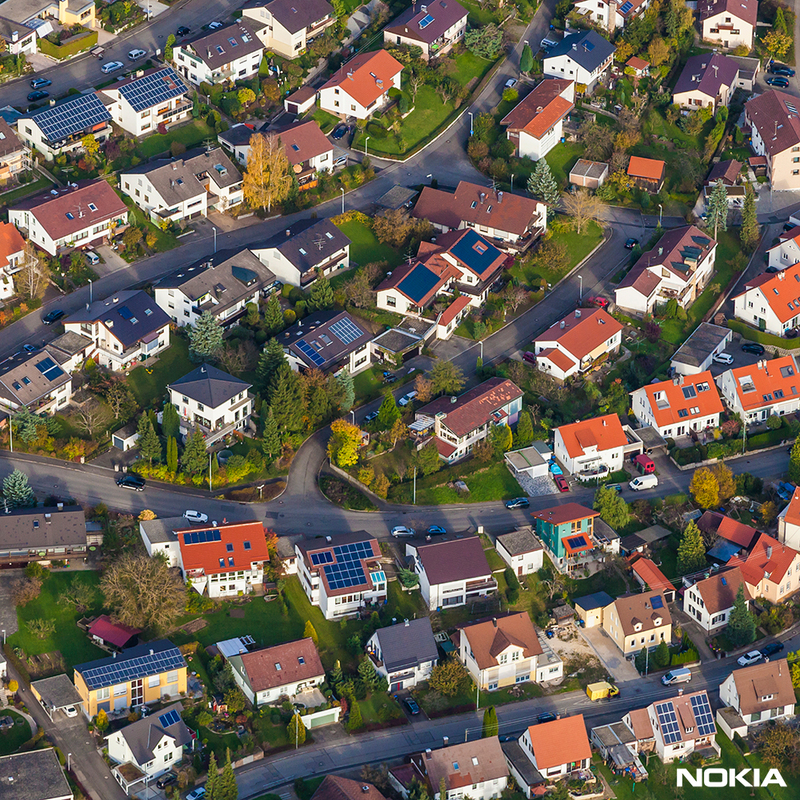 As their distribution grids evolve, the underlying communications networks need to do the same. Converged field area networks (FANs) built on wireless broadband technology may very well be the key ingredient towards intelligent distribution automation and efficient operations. With a converged FAN, power utilities can provide better services and greener power to customers. What’s wrong with today’s infrastructure? Why a converged FAN? Field area networks are not a new concept. However, they are mainly based on narrowband, proprietary, legacy or even unlicensed wireless technologies. Moreover, they typically only support one, or a very limited number of applications, which hampers the introduction of Smart Grid. To get around these limitations, some power utilities are deploying multiple FANs. For example, a power utility may have one FAN for an advanced metering infrastructure, another for monitoring of the line condition, and a third for equipment protection (Figure 1). Adding to the complexity, each FAN is likely based on a different networking technology and requires its own specific maintenance and support. As you can imagine, multiple networks leads to higher operational and maintenance costs, inefficient control, co-ordination, and communication between grid applications, and ultimately difficult application integration. What’s more, this approach cannot scale as those technologies are inadequate. As applications become intelligent, the volume of grid information collected and processed will increase significantly. But the underlying communications networking technologies are often unable to support the data tsunami that must move through the network to enable intelligent operations. 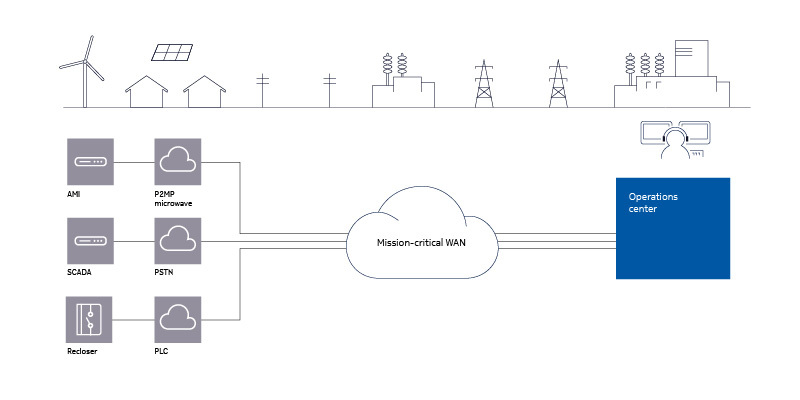 By moving to a converged FAN built on LTE and leveraging the power of IP/MPLS, power utilities can create a unified broadband network that provides secure, reliable connectivity for all grid applications (Figure 2). Utilities are then able to address their distribution automation requirements with a single communications infrastructure. 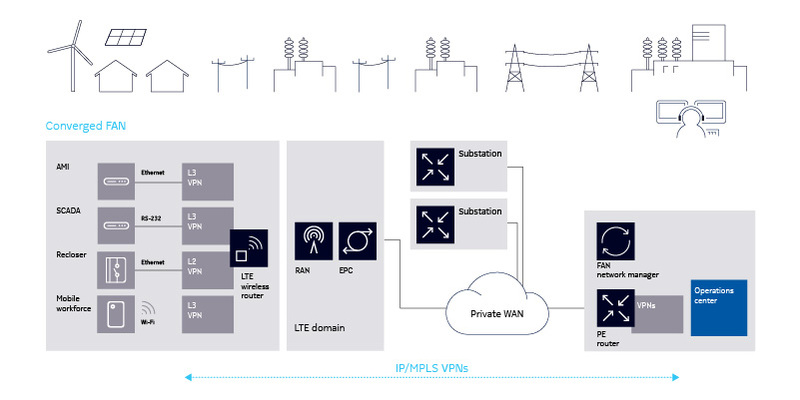 With IP/MPLS, utilities get highly scalable, end-to-end managed Layer 2 and 3 services, anywhere-to-everywhere communications over wireless, reliable data transport with MPLS and LTE based QoS assurance, highly secure and optimized machine-to-machine communications, which is critical as IoT becomes a reality. With LTE, utilities can enjoy scalable wireless broadband connectivity, better spectral efficiency along with higher throughput, flexible channel sizes for a variety of bandwidth requirements and low latency access. Furthermore, with automation moving deeper into the distribution grid, the converged FAN footprint needs to scale in number of network nodes and services. Hence a highly scalable network services platform with capabilities such as zero touch provisioning, FAN/WAN service integration, security management, and end-to-end service assurance is crucial. Ultimately, a converged FAN built with IP/MPLS and LTE allows power utilities to extend reliable broadband connectivity everywhere. A converged FAN has the capacity to support a multitude of grid applications while enabling true intelligent operations, along with improved power reliability and quality. And in the future, a converged FAN will also to play an integral role in power utilities’ deployment of Internet of Things applications and services. New white paperFor more information about the converged FAN, read the Nokia white paper: Rethinking the FAN for grid automation.